Moon in Gemini makes people contact, free, mobile. Increasing need to receive and impart information, share ideas and thoughts. People want to know what is happening around, what do the others. The position of the Moon in this sign increases the wealth of imagination and ingenuity. The mind becomes more agile, more nimble hands, and the people - to the talkative talkativeness. Mental activities at this time so active, which may lead to insomnia. Attention is usually dispersed on multiple things at once, there is a desire to take on everything at once. Typically, during this period increases the amount of correspondence, the number of telephone calls, but also errors occur frequently telephone connections. Often becomes late at the appointed time, the trend clearly emerges evade duties. Frequent traffic accidents, misunderstandings in proceedings, primarily related to letters and documents. There is a growing forgetfulness and distraction. Increased lightheadedness, tendency to ill-considered decisions and statements. When hard aspect to the planets moon appears brighter lightheadedness, shallowness, recklessness. A lot of effort is spent on nonsense. Because of nervous strain and inner turmoil, typical for this time, people are becoming fussy, inattentive, may behave inappropriately, which often leads to accidents and all sorts of misunderstandings. For example, you can forget to take delivery of in-store or confuse the platform from which the train goes. The information is unreliable and contradictory, so it is best to recheck. There may be delays, outage schedule traffic. The movable Gemini moon becomes volatile and unpredictable. Of course, this does not make all the lunar Gemini windy, frivolous and fickle, but in most cases refers to the activity of the mind, imagination, intellectual interests and creativity. As the Twins - the mental sign, Gemini moon tend to analyze your feelings to figure out why they think and act this way and not another, making decisions, mainly under the influence of mind rather than emotions and feelings. This does not mean that all lunar Gemini unfeeling just the immediate reaction in this case is the mental nature. 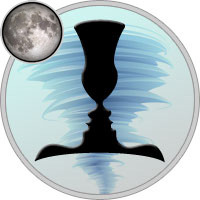 This position of the Moon gives his players the ability to grasp any incoming information on the fly, analyze and accurately express their evaluation of words, and therefore, if you wish, you can become a great critic. Moon in Gemini gives outgoing talkative and great personal charm. 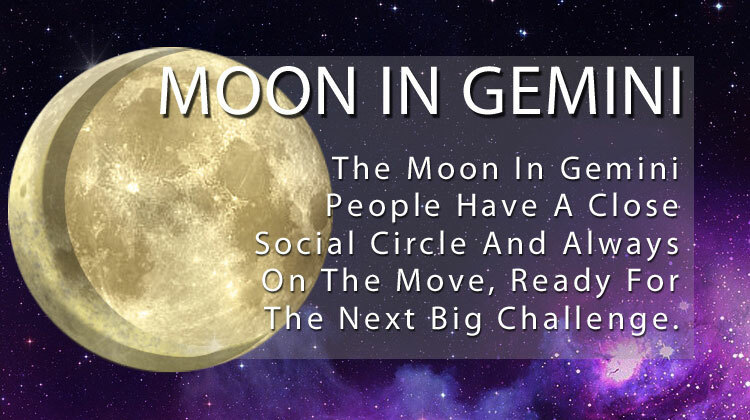 Moon Gemini is a charming lively nature that attracts people to them. The conversation with them can at any moment turn into the most unexpected interlocutor for parties affected by totally unpredictable questions. Eloquence and natural ability to help many fictional lunar Gemini to become writers, teachers and journalists. Lunar Gemini mostly restless and need constant stimulation. To be in limbo, alone or inactive for their worst punishments that causes the desire to quickly get out into the wild, re-enter into society and to be, as always, keep abreast of the latest developments. Moon in Gemini contributes to exceptional sensitivity to a changing environment. People with this position of the moon in the horoscope, faced with a new fact or opinion, could easily change his mind. From the side it sometimes seems that they lack the hardness, but their charm and emotional openness partly compensates for the instability of the views and attitudes. In relations with others Gemini Moon often show of freedom. They do not like to become a victim of someone’s emotional whims and fads, and do their best to maintain independence. New Moon in Gemini - time of idleness. Everybody is trying to spend their time easily without tedious explanations and arguments. Waxing Gibbous in Gemini - people are not likely to take any serious and responsible decisions. For life is beginning to treat more at ease and more often just laugh at your failures than bemoan his grave share. Full Moon in Gemini - it appears from nowhere who undertook chaos. Because there is a lot of cases of non-existence, one thing is applied to the other, causing a feeling of complete confusion. People lose the ability to act consistently and meaningfully. Bosses often than other days, and not only the heads, but just other people - accused of carelessness and stupidity. To emerge victorious from this situation - to listen to yourself and your feelings. All cases not alter, prioritize and measure the importance of cases follow those that are not urgent. Waning Gibbous in Gemini - mood swings occur in all people. People no longer understand you rarely find someone present sympathy. To relax as it is not clear from the nervousness - listen to your favorite music, watch some good film. Especially well suited comedy or vice versa, a melodrama. Moon in Gemini helps to make friends, get a positive assessment of the environment, to take a definite place in the team, to perceive everything that is connected with the "freedom from" spiritual growth, the union people. Time well for obtaining and exchanging information as well as short trips. Aries - under the Gemini Moon communicate, conduct business negotiations, to prove yourselve, express thoughts and be sure to take a stroll. Taurus - under the Gemini Moon solve financial matters, shop, give gifts. Gemini - under the Gemini Moon take care of your appearance and beauty guidance. Cancer - under the Gemini Moon get enough rest, allow yourself to relax. Leo - under the Gemini Moon communicate with friends, make plans for future. Virgo - under the Gemini Moon be assertive in careers and achieve you goals. Libra - under the Gemini Moon expand horizons, visit the temple or go on a journey. Scorpio - under the Gemini Moon requires compliance with the law, to deal with child support, taxes, and be sure to take the time to intimate contact. Sagittarius - under the Gemini Moon develop personal and business relationships, as well as any communication with the outside world. Capricorn - under the Gemini Moon take care of your health, pay more attention to work and daily duties. Aquarius - under the Gemini Moon go on a romantic date, flirt, make new acquaintances. Take time for creativity and communication with children. Pisces - under the Gemini Moon take care of your family, talk to parents, get your home beautification. Moon in Gemini increases the sensitivity of the lungs, respiratory tract as well as the arms and shoulders. There is a growing backlash against air pollution in the stuffy room. Likely difficulty breathing, shortness of breath, worsening of osteoarthritis and rheumatism in the shoulder area. Rheumatic "backache" in the shoulder area is especially suitable solicit ointments. Try as much as possible to spend more time in the air - in the woods or park. However, too light clothing in cold weather may make us very uncomfortable. Also avoid excessive load on the arms and shoulders. Days Twins - this is a good time for breathing exercises, reducing blood and metabolism, which leads to improvement of the skin. It may be used inhalation, ointments and other means to facilitate the airway. As for the operations and complex procedures on the lungs, the bronchi in the chest - they should be avoided. Moon in Gemini is favorable for short-term starvation, purging, gymnastics for muscles of the face, as well as aromatherapy, inhalations, steam baths. When the Moon in Gemini - excluded surgery in the trachea, bronchi, lungs, tongue, upper extremities of the nervous system. In the days of Gemini will be good surgery and procedures related to the liver, as well as in the hips. Showing all blood-purifying procedure. Recommended treatment of liver diseases, medications, blood overclocking. In the days of Gemini is better not to be cut, especially in the waning moon. Hair can become thin, brittle and fall out when repeatedly will get your hair cut at this time. During the Moon in Gemini is not recommended to do manicures, pedicures, gel nails to build up, to draw eyebrows, curl the tips of lashes, cutting and coloring hair. Days Twins are great for aromatherapy, inhalations, massages and baths for hands, visit bath. Among the cosmetic, preferably light, quickly absorbed moisturizing and nourishing creams with herbal extracts and bioactive supplements of cereal seedlings. In decorative cosmetics is permitted to use more bright colors and expressive accents. Moon in Gemini - a fertile time, any manipulation increase the productivity of plants, including weeds. Therefore, "to touch anything that should bring the harvest, and do not touch what is his to bear should not. Time" Shouting "to chaff" was not on "Nivas" cultivate the soil, weed the weeds to deal with any pest, can be collected harvest and canning. Caring for the plants, which should give the seeds and have a bone. No watering, no spray, gently transplant.